The startup OEM manufacturer, OnePlus, continues to drum up some grassroots excitement about its upcoming device, the One. We have heard hints towards the phone’s specs and accessory options, and we even have a launch date, but up until today nothing as far as pricing goes. OnePlus took to Twitter to change that. 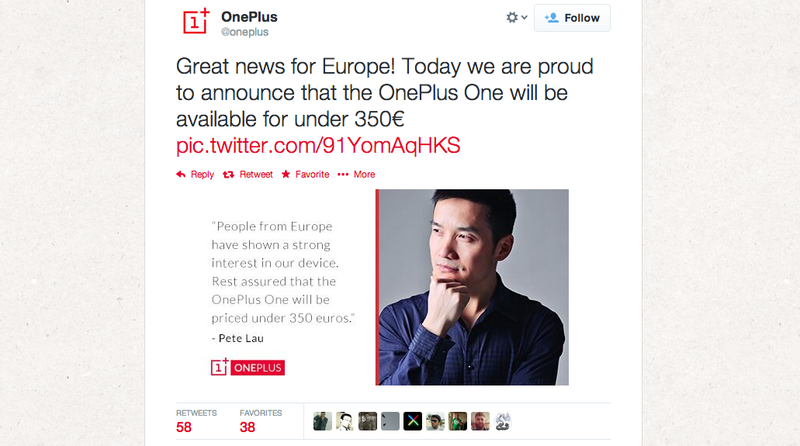 In a quote that was then publicized on OnePlus’ Twitter account today, CEO Pete Lau said that the European market has shown good interest in the One. He apparently went on to say that they could expect a sub-350€ price point when the device eventually launches. That translates to about $480 for the unlocked, Cyanogen-powered smartphone. With an alleged 5.5″ screen packed into a 5″ body, swappable backs made from different materials like denim and bamboo, and customized Cyanogenmod skins, the OnePlus One is stacking up to be a pretty decent device. Would a price point under $500 for an unlocked phone catch your attention?